Kudou Shinichi is a high school detective gaining fame for helping police with different cases. His childhood friend, Ran, calls him a "推理オタク" (detective geek) since his primary interest and conversational topic is usually focused on detective work or detective novels, especially Sherlock Holmes. His parents reside in America at present, although Shinichi is still in Japan. His mother is a former famous actress and his father is a popular mystery novelist, no doubt explaining Shinichi's interest in the subject. Shinichi believes there is one truth out there and it's the job of detectives to find it to solve cases. Besides detective work, Shinichi also is interested in soccer and Ran. Shinichi was a bit arrogant about his abilities, and perhaps rightly so, but when he tries to investigate a crime syndicate--he meets his match. A member of the syndicate catches Shinichi by surprise, forcing him to drink an experimental poison meant to kill him; however after the syndicate leaves Shinichi for dead it has the unexpected effect of shrinking his body back to that of a small boy. Warned by his trusted neighbor, Professor Agasa, not to reveal his new identity to anyone, lest the syndicate find out, Shinichi has to hide his identity from Ran even. When she comes looking for Shinichi, he has no choice but to make up a fake name, Edogawa Conan. With his new identity in place, Conan goes to live at Ran's place, hoping that information he needs to get back to his true form will eventually pour into her father's detective agency. 毛利の家で預かってる子 (The child staying with the Mouris). Most people first identify Conan as such. 居候 (parasite or freeloader). Mouri introduces Conan as such occasionally, even though he's been given 10 million yen for taking care of Conan. 大バカ推理之介 (This translates to something roughly like "Mr. Idiot Detective"). Ran refers to Shinichi as this when she's frustrated. 探偵キッド (Tantei Kid, or "detective kid") Shinichi calls himself this as a play off Kaitou Kid, the infamous gentleman thief. 1. Shinichi's name might be better rendered in English as "Shin'ichi" since there's a definite pause between the n and i (the kana looks like this しんいち). The apostrophe makes the word too awkward in my opinion, though, so it's left out despite the clarification it creates. Also, Jade pointed out that Shin-ichi (though this would be with a different kanji) can be read as "One Truth". 3. 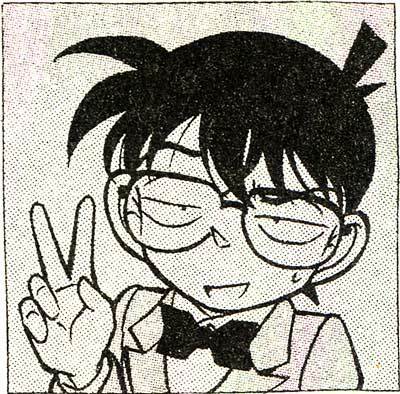 Shinichi gets the name Edogawa Conan from the books on his father's library shelf. Conan is obviously from Arthur Conan Doyle, the creator of Sherlock Holmes. Edogawa comes from Edogawa Ranpo, the first great Japanese mystery writer. Shinichi choosing a pseudonym from him is particularly funny, since Edogawa Ranpo was Hirai Tarou's pen name. "Edogawa Ranpo" comes from "Edgar Allen Poe." It helps to take the "w" out to see it: "Edoga" (w) "aRan" "po". So Shinichi is taking his name from a mystery writer who took his name from a mystery writer. Detective Conan is © Aoyama Goushou, Shogakukan, Touhou and other rightful owners. Site © 2003-2004 H. S. Winston.